A few months ago, my wife was shopping online for a gourmet food item as a housewarming gift. She entered her email address as part of the order process so that she would receive a confirmation that the gift had shipped. The next week, my wife received an email from this store about their specialty cheeses. She was intrigued, but had no interest. The next week the store sent an email about cooking sauces. She continued to receive one or two emails a week from this shop even though she made no further purchases. After a couple of months, she tired of the constant barrage of these emails and clicked on the unsubscribe link and opted out. Where did this store go wrong? At no point did the store’s web site or email offer my wife any preferences. She really had no interest in the food items as we can purchase most of these locally, but the store’s specialty cookware was appealing. A continuous stream of emails that were not relevant to her interests showed lack of personalization. But the fact that the unsubscribe mechanism in the email offered no other options meant that this store lost a potential customer who was interested in one of its product lines. The content in the emails was simply not relevant and resulted in an opt-out which is a channel closing act. How could this situation been salvaged? An online preference center could have made the marketing content more relevant to my wife’s interest (as well as their other customers). Instead of the universal, all-or-nothing opt-out, the preference center could have offered options for opting in to certain content, perhaps organized by product line. The preference center could have asked how frequently she wished to receive communication from the store. A persistent preference center would have allowed my wife to later change her choices and perhaps opt-in to other content. Establishing a persistent online preference center is a critical path for any marketer — and for channels beyond email. By making the message relevant to the recipient, the store could have personalized its communications to the taste of the recipient, building loyalty and helping to extend the customer relationship. 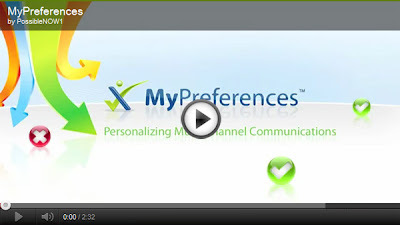 Personalizing the message is a critical path element for marketing success.